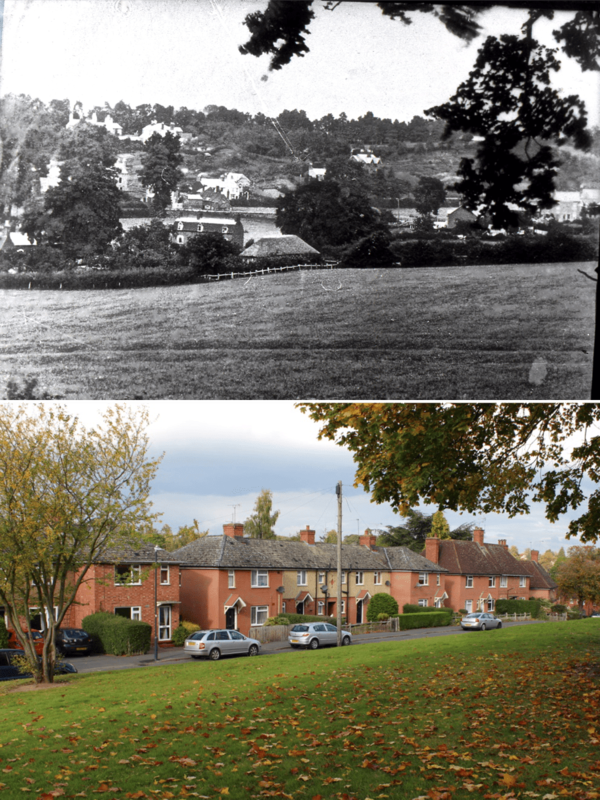 This Then & Now pairing shows the open land now occupied by Hyde Road. The ‘then’ photo shows what looks like an idyllic view across the fields, over the mill brook at the bottom end of School Lane and across to Lower Ladyes Hills and the Common in the distance. At the bottom of the valley can be seen the mansard roof of Noah’s Ark which stood just to the left of the lower entrance from Hyde Road onto School Lane, where the mill brook curved round sharply to follow the line of School Lane down to the weir by the bridge at Manor Road. The hillside shown slopes gently down from Upper Rosemary Hill towards the junction of School Lane and Manor Road. According to Robin Leach and Geoff Hilton in A Portrait of Kenilworth in Street Names (Third Edition, Rookfield Publications, 2015) Hyde Road was built on what was known as Noah’s Ark Allotments, named after the Noah’s Ark house mentioned above. It was build as part of the ‘Houses for Heroes’ campaign to house WWI veterans and opened in 1921, becoming fully occupied by 1923. Hyde Road was so-named in honour of the Hyde Earls of Clarendon, the Villiers family, who had held the castle since Charles II granted it to Laurence Hyde, 2nd Earl of Clarendon in 1665. The authoritative account on this, and other ‘Houses for Heroes’ developments, can be found in Robin Leach’s book Kenilworth People and Places – Volume 2 (Rookfield Publications, 2013).